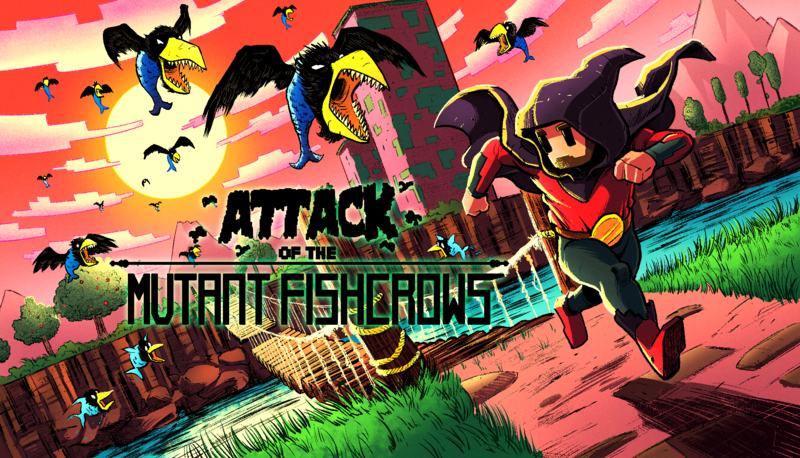 Attack of the Mutant Fishcrows, A Fast Paced Survival Platformer with flying fish that are swimming crows that are mutated half breeds of your nightmares! The game is set in a dark & colourful world where the land has become hostile and dangerous. Chaos spreads and with each passing day the mutant fishcrow grow stronger. In this retro platformer, you create your character and fight your way through a chaotic world under attack. Run,jump,dodge,climb,swing and swim your way through each area of the world. Every day that passes is another day the mutant fishcrow grow in their numbers. Help the people of this world, end the terror.